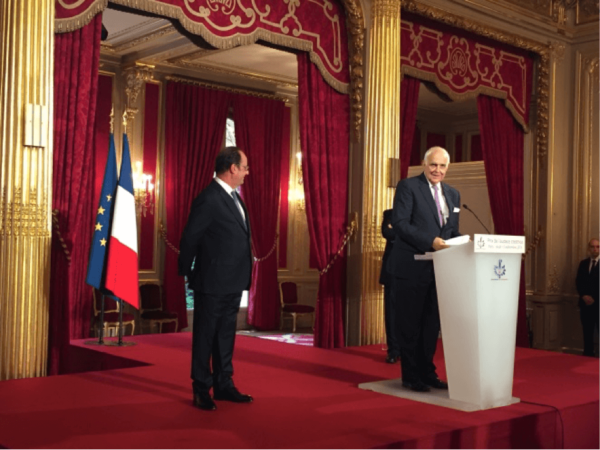 The French President of the Republic awarded the CEO of Robertet, the world leader in aromatic natural raw materials, the 2016 “Audacity in Creativity Award” on Thursday, 15 September 2016. Created in 1996 by Marc Ladreit de Lacharrière, this award distinguishes the accomplishements of French businessmen who have managed to grow their company in both results and profitability while also creating jobs in France. The intention of this award is to show that corporate growth and increasing profits can be achieved, while also developing employment opportunities. It also shows that successful businessmen in France can still have a winning edge, risk-taking approaches, and succeed in generating wealth an opportunities.